Introducing the pioneering Tru64 Unix to my little network and having it talk to my various OpenVMS Alpha, OpenVMS VAX, Ultrix VAX, PDP-11/24 RSX-11M-PLUS, Windows NT 4.0, Windows XP, Power Macintosh G4 MacOS 9, Solaris 11 and Linux systems is so much fun! Tru64 Unix was renamed from Digital Unix which itself was originally named DEC OSF/1 AXP. It is a complete and powerful commercial-grade 64-bit Unix operating system originally released for DEC Alpha processor. Like Apple's MaxOS X (and therefore also iOS, tvOS and watchOS), it is based on Carnegie Mellon University's Mach kernel. It illustrates the beauty of the micro-kernel architecture. Unlike Digital's previous BSD-derived Ultrix, Tru64 is the root of a third Unix family by itself, in addition to BSD and System V.
The complete documentation set for Tru64 Unix is available online. I installed Tru64 Unix 5.0 inside a 32-bit FreeAXP 2.6.1.560 instance emulating DEC AlphaServer 400 4/166 from the publicly available Tru64 Unix 5.0 installation CD ROMs. Like all of my DECnet nodes, I dedicated one network adapter to TCP/IP and Microsoft networking protocols (NetBIOS, NetBEUI), and another network adapter to DECnet. Using a XDMCP remote Unix desktop session from MobaXterm, I could launch the Tru64 graphical desktop that is an implementation of Common Desktop Environment (CDE) - a collaborative effort of Sun, HP, IBM, DEC, SCO, Fujitsu and Hitachi. Interestingly, CDE is now also available as open-source. Finding DECnet-Plus for Tru64 UNIX V5.0 was a bit tricky, but with the help of a thriving DEC user community, I could install DECnet-Plus (DECnet OSI Phase V) for Tru64 Unix and connect to HECnet. It turns out there was no DECnet Phase IV stack ever released for Tru64 Unix 5.0, so I have to deal with mysterious (to me!) NCL commands instead of the familiar NCP. I then tested the Tru64's FAL service from MacOS 9 Pathworks for Macintosh successfully. 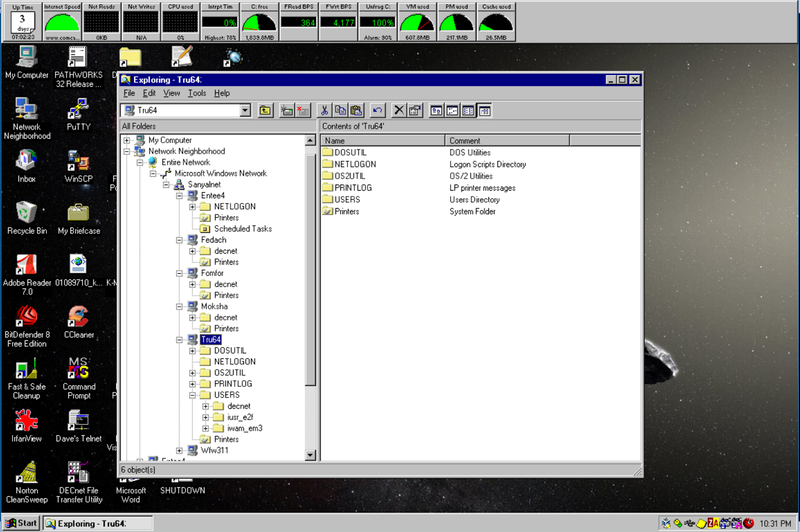 I also tested Tru64's DECnet FAL service from a Windows XP system over DEC Pathworks 32 with success. In addition to DECnet Plus OSI for Tru64 Unix, I installed the Advanced Server for Unix kit. This basically added Windows networking with Windows advanced server domain controller functionality to Tru64 Unix. Interestingly, it installed "NetBIOS over DECnet" on the DECnet NIC in addition to NetBIOS/NetBEUI on the TCP/IP NIC. I configured Tru64 as the secondary domain controller. 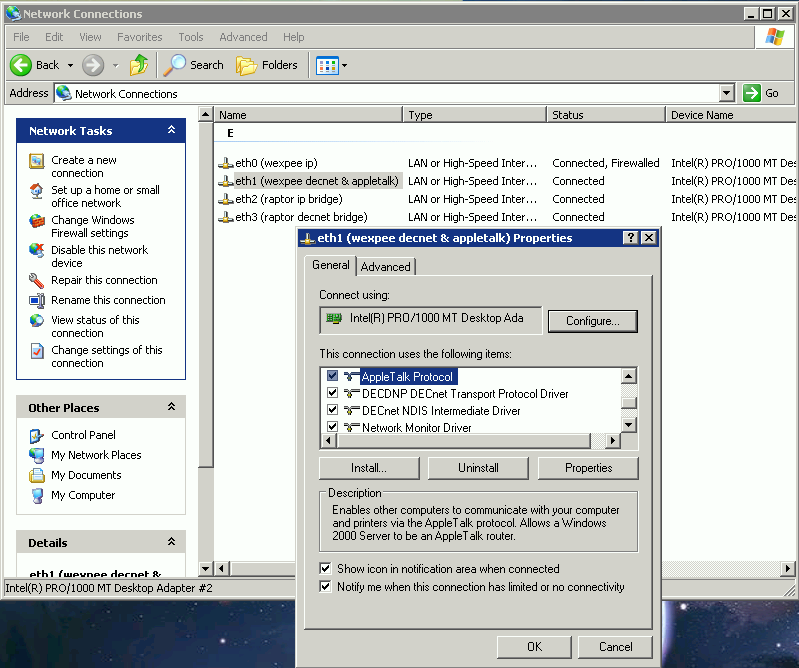 Sure enough, Tru64 shows up in the list of computers reachable over Windows networking from ENTEE4 which is a Windows NT 4.0 Server with TCP/IP and DECnet protocol support. I saved some of the installation sessions in log files for reference. The following log captures installation of DECnet for Tru64 Unix 5.0 and successful login over DECnet to remote HECnet nodes BOPOHA and FRUGAL. This log captures installation of the Tru64 Unix Advanced Server for Unix package which allows Tru64 Unix to participate in a Windows network environment for seamless file and printer sharing, using Microsoft's NetBIOS and NetBEUI protocols over DECnet and TCP/IP. However, this still leaves Anacron to send emails with subject lines like "Anacron job 'cron.daily' on node foobar" every day, week and month. To get around this, edit /etc/anacrontab using your usual favorite editor and add MAILTO="" before the Anacron jobs list. # See anacron(8) and anacrontab(5) for details. This works on Ubuntu 14 and Ubuntu 17, and should work on all Anacron-enabled Unix and Linux systems. Windows 2000, which I still consider Microsoft's zenith, shipped with native support for AppleTalk. This made it possible to seamlessly share files and printers between Macintoshes and Windows 2000 PCs over AppleTalk networks. When Windows XP came along it was sadly missing AppleTalk protocol support - Microsoft had decided to take it out of the package. But discerning Windows users soon found a trick. One can simply copy over just six files from an existing Windows 2000 installation configured with AppleTalk into the Windows directory of XP. 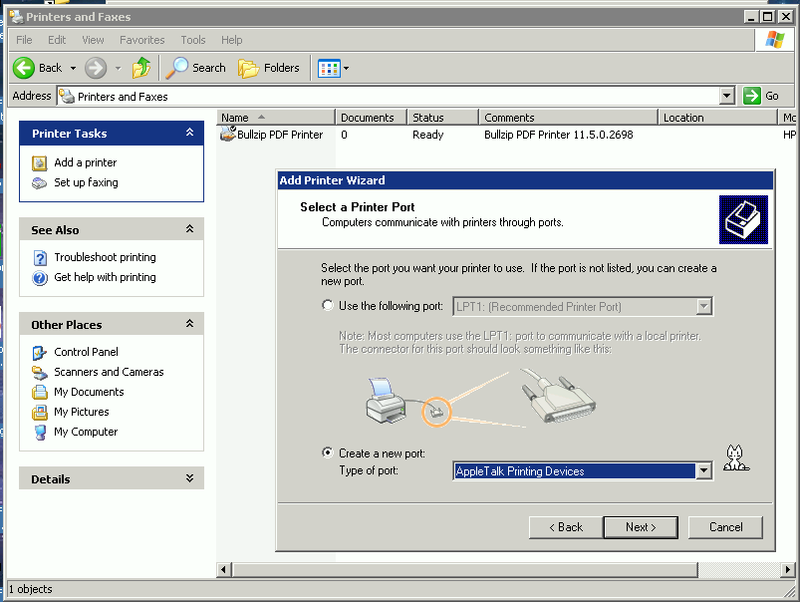 After copying over the six files and rebooting, XP offers AppleTalk as an additional protocol that can be installed on any network adapter. This makes a nice addition to my little but diverse AppleTalk network consisting of MacOS 9 and Linux (via netatalk) by now letting Windows XP support AppleTalk printers. 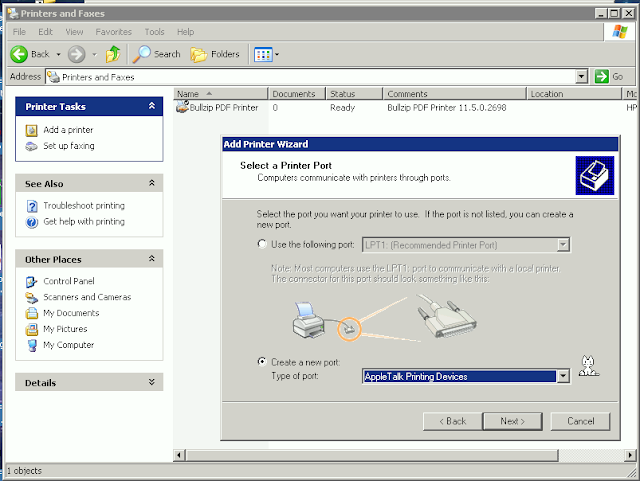 To connect an AppleTalk printer to Windows XP, use the usual "Add Printer" wizard from the "Printers and Faxes" control panel. 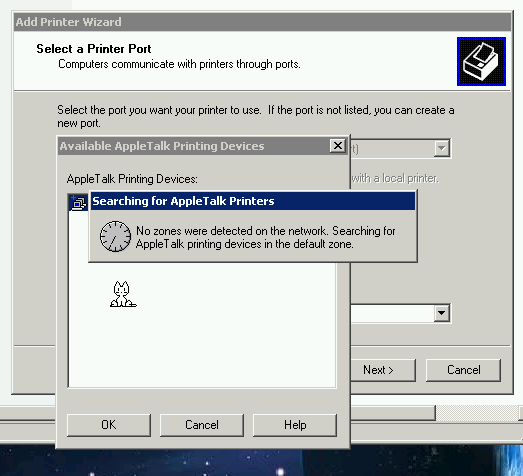 You can create a new port for "AppleTalk Printing Devices" type of port. Windows XP will go and look for connected AppleTalk printers and make them available. Unfortunately, this is where my test ends, since I do not have an AppleTalk printer to test with! A copy of these six Windows 2000 AppleTalk files for Windows XP can be downloaded from my google drive. If you are more interested in Neko the mouse-chasing cat who lives on desktops, you can adopt Neko for your desktop from here.